Cleaning, cutting & a birthday cake! Our parents and children are excited about starting Clic for 2014! And spring cleaning on the first day was planned. Instead of school where the first day meant getting kids assigned their classrooms and teachers, and having the equipped with books and uniforms, our kids cleaned their “school” with their hands – everyone was involved in the process – parents as well as toddlers! Some helped to organize the playroom, some volunteered at the study room (or conference room as it referred to) while others helped at the kitchen. 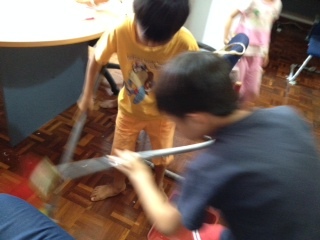 The children worked tirelessly for hours without complains. When I asked them later how they felt about it, they said it was fun! Because they also get to play in between cleaning and working! Parents did not have to yell or threaten to get the kids to work. Is this normal? One might ask. Well, the answer is Yes! 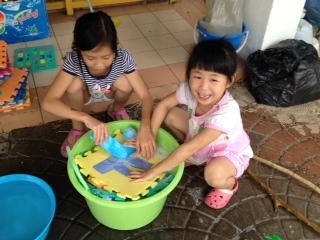 When children are brought up with a clear understanding that working is an integral part of living, and as children, they have the responsibility to help keep the house clean and tidy so that everyone gets to play and learn in a clean and healthy environment. They get it. They do! We do not need to give them material rewards for that. Just a pat on the back, to say “Well done!” and “Thank you!” is more than sufficient to make them feel good about themselves. Of course, having a group of like-minded families working along side helps a great deal to enforce the positive spirit into them. That’s the beauty of a support group! 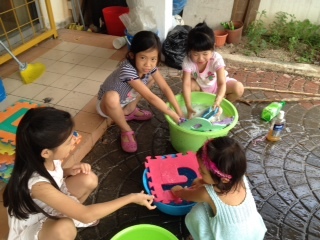 And after all the cleaning, fixing and mopping, we had a birthday do for two birthday kids – Yun Zhe who turned 11 and his cousin Yu Xi, who just joined Clic together with her 2 younger siblings, just turned 7! A simple vegetarian lunch with a vegan cake baked by Amrita! Looking forward to another year of awesome unschooling activities!